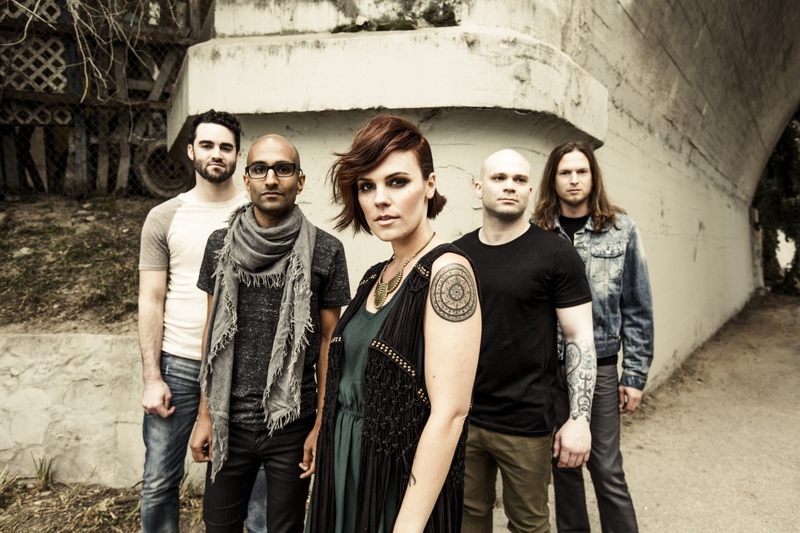 Flyleaf’s brand new album “Between the Stars” launched yesterday marking another momentous occasion in the bands history as it featured not only new sounds but also the brand new, beautiful voice of Kristen May. Thanks to Yahoo! Music, fans were able to stream this album last week while they read a short but in-depth interview from Kristen and lead guitarist, Sameer Bhattacharya. “Between the Stars” was produced by Don Gilmore, who is responsible for many albums from Bullet For My Valentine, Korn, Linkin Park, Good Charlotte and many more. Flyleaf gave all of us a teaser of this album with a single and accompanying music video of opening track “Set Me On Fire” via Revolver. The track starts with a lead-in, fuzzy bass riff, which brought me a lot of comfort. The reason it brought me a lot of comfort was because all I had to go on as far as new sounds of Flyleaf was the live EP “Who We Are”, and though it featured live tracks of ‘Call You Out’ and ‘Fire Fire’ there was a newly produced track that featured Sonny Sandoval of P.O.D and it sounded VERY different than what you’d expect to come out of Flyleaf. Was it bad? NOT AT ALL! I still jam it all the time! It’s catchy, it’s fun and I love it. But, it was definitely more poppy and it didn’t sound much like the Flyleaf that I’m accustomed to musically or lyrically. “Set Me On Fire” reassured me that the band is still doing big, crazy, epic, hard rock music and that Kristen May is a perfect addition to their group. Not only that, but it showcased just how diverse the band truly is! Now with the comparison between “Something Better” and “Set Me On Fire”, Flyleaf has proven that they can do ANYTHING and they can do it well! That being said, for those of you concerned that Flyleaf was doomed or not able to hold up without Lacey Sturm, you can now stop being concerned. They’re live performance still speaks entirely for itself and the new album still features the distinct heavy rock greatness that Flyleaf has always been. Kristen May, though certainly not Lacey Sturm, is a new flavor of lead singer that compliments Flyleaf’s music perfectly. Flyleaf is starting a new chapter and “Between the Stars” is proof that this new chapter is the start of another, new amazing journey. These guys have been writing and playing music as Flyleaf for over 12 years and they’ve just made a huge change that is going to bring about a whole new experience that never could’ve been made with Lacey Sturm. Several new doors have now opened for this band and you can expect over the next many years the band will walk through all of them until there is no more doors to open anymore. There are also some doors that have closed. A difference you’ll likely note in Flyleaf’s new music and about Kristen May is that there’s no screams which was signature to Lacey’s vocal style. Those expecting that Flyleaf will still sound the exact same will be disappointed, but those expecting something new and refreshing to come out of what is already a very talented band will have a fantastic experience. It can be hard to accept change but we urge you to do so because there’s a lot of excitement coming your way in the Flyleaf department. If you don’t trust my judgement, I suggest you quickly head over to Yahoo! Music and get a preview of the album yourself or watch the Set Me On Fire music video. You’ll see just like I did that Flyleaf is starting something new and amazing and you’ll want to be a part of it just as much as I do. To further explain things, I talked with their guitarist Sameer Bhattacharya to learn more about what the new sound is going to be like, and how Kristen May has changed things and what things have unexpectedly not changed. If you are still a skeptic about Flyleaf, I don’t know how I can help you. All I can say is, you’re missing out. If you’ve seen the light, you need to go here right now and support this movement by buying the album or better yet, get out to the live shows they have coming up and see for yourself.